Finkstonball XXI is over and what a year this was! Thank you all for comming to Athletics Ballpark and celebrating this sport we all love so much! The final stats for softball and baseball are available in our statistics section. Congratulations to all teams and all players to their awards! 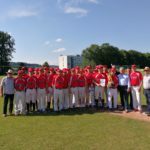 In one of the most dramatic finals of Finkstonball history, the Austrian Baseball National Team could finally win it’s first Finkstonball Trophy, walking-off in extra-innings against the ASAK Athletics. The teams were fighting for every out and the lead changed several times. In the 8th, Austria could score one run more than the A’s, winning 10:9. The Vienna M-Stars are Finkstonball Champion XXI! The girls from Vienna had to take a loss in their first matchup with Team Awesome on Sunday. One day later they could take revenge when they needed it the most. From the first at bat on, the M-Stars showed the willingness to take the win home and were able to score at least one run each inning. Team Awesome had problems coping with the pitching of Carla Langthaler, who later also won the MVP award of the softball tournament. 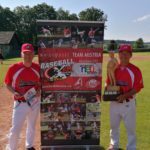 The Vienna M-Stars walked away with a 18:2 slugging fest and take home the Finkstonball Trophy 2018. In the game for the third place, Austrian Future faced the St. Pölten Pee Wees. 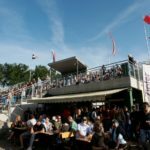 The future of Austrian Softball looked bright, as the team developed over the course of the tournament and could not only beat the Swiss U22 National Team the day before, they also worked very well against the experienced women’s team from St. Pölten, the capital city of Lower Austria. With the European U22 championship comming up in July, the U22 national team is looking forward to their best result in Softball Austria’s History. Congratulations! The Austrian Future Team could win today’s game for the 5th place and walk away with the trophy. The young Austrian team put on a great show against the Swiss U22 National Team. They strated off well, score more in the third and never looked back. Congratulations also to Swiss team, who showed some great games over the course of the tournament! Also the baseball tournament has the first final results in. 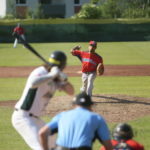 While BK Vindija Varazdin won the 7th place in last nights game and the Sissach Frogs finishing 8th, the Dominican All Stars and the North baseball battled for the 5th place in Finkstonball XXI. The game started off with some runs of the North, but the Dominicans stayed in the matchup. In the end their lead was melting, but the Canadians could walk away with the win to earn the 5th place. A big shout-out to the Dominican AllStars for beeing such great guest and showing great baseball and sportsmenship, year after year! Sunday at Finkstonball XXI is over and we have some finalists set for tomorrows showdown of this year’s tournament. 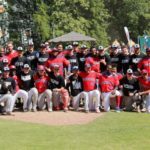 The Austrian Baseball National team fought their way into the final in dramatic fashion and beat the X-Presidents in Extras. The second finalist will be determined in the second semifinal tomorrow at 10:50. The Final of the baseball tournament will start on Monday at 13:30. 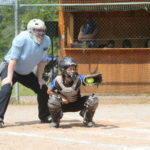 In the softball tournament, also the M-Stars put on a thrilling show against the Pee Wees, who came just short and had to let the Viennese girls move on to the Softball Final, starting tomorrow at 12:45. M-Stars move on to the final! The Vienna M-Stars win their hope-round game against the Pee Wees St. Pölten and move on to the final game, tomorrow at 12:45 against Team Awesome. 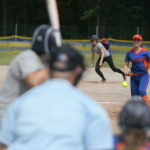 The girls from Vienna had a tough fight against St. Pölten and they needed to fight until the very last inning. In the end, they won by just one run: 5:6. Your hometown boys, the ASAK Athletics Attnang-Puchheim, made it to the semifinals! In the final game of group A the Dominican All Stars started off strong. It took the A’s some innings to start-off their powerhouse offense, but from the fourth inning on, they took over and played solid defense to finish the game with a 9:5 final score. With this, the Athleitcs qualify for tomorrows semifinal against Team Hungary. Gametime: Monday, 10:50 AM.